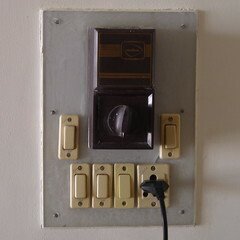 The other switches turn on lights, but there's always at least one switch that doesn't seem to do anything at all. Flipping the nonworking ones fills me with unease -- who knows what I just turned on or off? Here, we've plugged in an emergency light that goes on when the power gets cut, which has happened at least twice so far. The building has its own generator, so outages aren't as disruptive as they could be.